One of the world’s largest internet-based TV and On-demand service provider for South Asian content, YuppTV, announced the launch of Freedocast Pro Device and Freedocast Live Streaming Platform on April 24th, 2017 in New Delhi. Providing end-to-end solutions for users to go LIVE instantly, anywhere anytime, the Pro Device & Live-Streaming platform also enables users to broadcast live videos on multiple platforms such as, Facebook and YouTube Live, Twitter/Periscope and others. 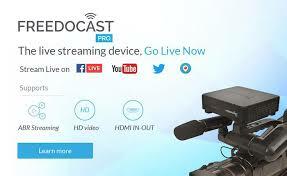 To best suit the needs of broadcasters, Freedocast Live Streaming Platform is designed as a one-stop-solution providing cloud transcoding & Adaptive Bitrate streaming for best viewing experience in low bandwidths, real-time analytics, viewer interactivity with chat moderation, Ad-integration, pay -per-view, geo-blocking & password protection for control of events. 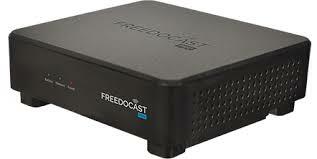 Any external encoder can be used to go live through Freedocast Platform and simultaneously stream to multiple platforms. YuppTV has 25000 hours of entertainment content catalogued in its library, while nearly 2500 hours of new on-demand content is added to the YuppTV platform every day.YuppTV offers Live TV and Catch-Up TV technology. It has recently launched YuppFlix, a movie on demand streaming service for Expat Market and YuppTV Bazaar an online marketplace for the premium content curator. 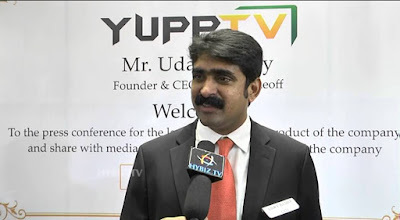 YuppTV is currently ranked #1 Internet Pay TV platform for Indians living abroad and the largest Internet TV platform from premium content availability in India. YuppTV is the most downloaded Indian SmartTV app and it also boasts of 8 million mobile downloads with 4.0 user rating.